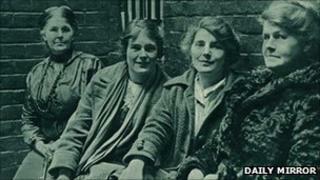 A campaign has begun to clear the name of a suffragette, jailed for attempting to poison a prime minister. Alice Wheeldon, who lived in Pear Tree Road in Derby, was found guilty of the poison plot against David Lloyd George in 1917. Sentenced to 10 years, Mrs Wheeldon was released after nine months due to ill health from hunger strikes. Historian Dr Nicholas Hiley said new research showed the case against her had been "shaky". At the time of World War I, Mrs Wheeldon was a 50-year-old Derby shopkeeper selling secondhand, high-end clothes. She was a mother of three daughters and a son and brought her children up to be free thinking and independent. But Mrs Wheeldon and her family were also Marxists, atheists, vegetarians, supporters of the suffragette movement and conscientious objectors to the war. According to Dr Hiley, who is based at the University of Kent, their "unusual" beliefs brought the family to the attention of MI5 during WWI. "MI5 had become very fixated on political opposition to the war and they had agents who were working in trade unions. They came to Derby, quite possibly to investigate the Wheeldon family." But Dr Hiley said the agent they sent was "spectacularly unreliable". Working under the alias of Alex Gordon, William Rickard was employed just two years after being released from Broadmoor Mental Hospital. He was a convicted blackmailer and had twice been declared criminally insane. From fresh research, it is Dr Hiley's belief that this "unbalanced fantasist" was a member of an MI5 department facing closure which fabricated this plot against the Wheeldon family to justify keeping their department open. On 31 January 1917, Alice, her daughters Hetty Wheeldon and Winnie Mason and son-in-law Alfred Mason were arrested and charged with plotting to murder Prime Minister Lloyd George. The initial hearings were held at the Guildhall in Derby before the main trial was transferred to the Old Bailey. In March 1917 Alice was sentenced to 10 years, Alfred seven years and Winnie five years. Hetty was acquitted. Lloyd George released Alice after nine months in December 1917. She had begun a hunger strike and it was thought politically unwise to run the risk of her dying in prison. Alice died in February 1919, a victim of the influenza epidemic and still in poor health from her spell in prison. Dr Hiley said clearing Alice's name was preferable to a pardon. "I think a pardon would be quite easy to get in legal terms because the trial was so shaky," he said. "I do think that Alice Wheeldon was a Marxist hoping for a dramatic change in the government, so from her point of view, I think it would be rather strange for us to approach a Conservative government headed by an old Etonian for a pardon. "I think probably the idea of clearing her name is a more interesting one." Dr Hiley will be speaking about Alice Wheeldon at the Friends Meeting House in Derby on Thursday evening, addressing the Derby People's History Group on how to clear Alice's name.